Possibly the smallest arm balance ever; baby Bakasana builds strength in the upper body and core, without that fear of face-planting that the traditional Bakasana carries. Oh yes…. And it’s fun! The number one thing this mini arm balance teaches us is to lighten up! Stop taking things so seriously and open up to practicing new, fun asanas. When we let go of trying so hard to ‘get it right’ all the time, we open up to a sense of experimentation and playfulness within our yoga practice. We seem to now live in a ‘Mcdonalds society’, where we want results from our minimal efforts, and we want them NOW…. Well, the important thing to realise is that a lot of strong postures may take YEARS to get the hang of, and we shouldn’t expect to be able to do everything we’re offered in a yoga class perfectly. (hint hint, that’s why it’s called a yoga PRACTICE) So, starting small and building up is a good way to integrate the strength and mindset we need for approaching new poses and new challenges. Baby Bakasana primarily engages the mid and upper core, while strengthening the arms and shoulders for more challenging arm balances like Pincha Mayurasana (forearm balance). From an all-fours position, take a few cat / cow stretches, focussing on rounding the spine and pressing up between the shoulderblades. From there, move to forearm plank, allowing the shoulders to come a little past the elbows, and bringing a slight lift in to the hips to engage the upper core muscles. Afterwards, hold Navasana for a few breaths to engage a little more core awareness before coming up to stand. The whole body should be nice and warm, so move through your Surya Namaskars, and finish your standing sequence with ‘Goddess pose’ to bring stability to the hips and thighs! From Tadasana, lower down and practice Malasana to release through the hips, before moving through to Shishulasana, or Dolphin pose, which is useful for building the strength needed for baby Bakasana in the arms and shoulders. From downward facing dog; walk the hands in towards the feet and squat down in to malasana. Set yourself up as though you were going to transition in to dolphin pose, with the elbows just a little wider than shoulder width and the hands either interlaced (a little easier) or palms firmly flat on the floor. From here, tuck the toes, lift the hips slightly and tip toe forwards so you’re making yourself as small as possible – this is the smallest arm balance ever, after all! As you would for the full Bakasana; bring the knees on to the upper arms, as high as you can – almost in the arm pits. Lean forwards, while engaging the abdominals and lifting mula bandha. Ensure your knees are firmly on the backs of the arms and bring the spine in to a curl. Lean your weight forwards a little more while extending the chest forwards and continuing to round the spine and firming the forearms and hands on to the floor. All you need to do from here is to point one foot and you’re almost there. Point the other foot so both feet are off the floor and you’re in your Baby Bakasana! Concentrate on tucking the heels up towards the bum, and keep pressing those forearms down firmly. You’ll notice that even though this pose is a baby, it’s a pretty strong baby – but unlike full crow pose, there’s a lot more stability and less fear of falling here! 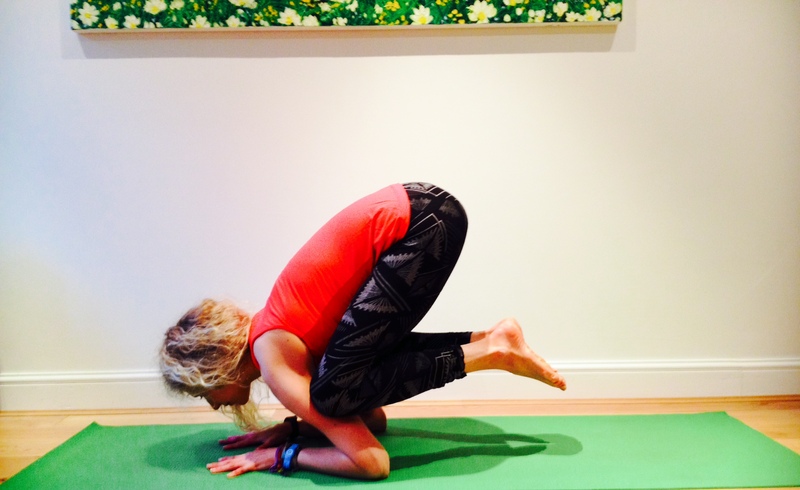 To counterpose baby Bakasana; come back on to all-fours and ease out the shoulders with ‘thread the needle’. Afterwards, sit back on the heels and interlace the hands behind the back to open out the chest and counteract the curling of the spine. If you have time for a little relaxation; try lying the spine along a bolster or a few big propped up pillows to allow the chest to fully open out and the shoulders to relax. The most important thing is to have FUN with this pose while you build strength, so let go of the need to be perfect and just experiment with this tiny little arm balance!